Vail is a scenic paradise that has amazing views, great restaurants and stunning skiing facilities, so it’s no surprise that it is one of the most popular vacation spots in the country. For those that love skiing, this really is your playground, with miles of slopes to entertain you. But don’t worry if skiing isn't your thing- with spas, restaurants, amazing scenery and great weather, it’s an ideal location for everyone! With its amazing spa and more intimate ambience, featuring just 20 rooms and 7 condominiums, Vail Mountain Lodge and Spa offers something unique. Vail Mountain Lodge and Spa is a relaxing, memorable place to stay, including free yoga classes and the best athletic club in Vail to keep you active even without skis. The lodge also offers amazing breakfasts so you can start your day the right way. Vail Mountain Lodge is a truly amazing place to stay. Nestled at the heart of Vail’s fabulous skiing facilities, this intimate mountain resort offers a lot more than you may expect. Exquisite dining at Terra Bistro, free fitness and yoga classes, and access to the amazing full-service spa and the Vitality Center, Vail’s only complete wellness service, give a truly luxurious experience. With just 20 luxurious rooms and 7 condominiums, this is an intimate hotel that delivers incredible service. Attentive without being intrusive, everything you need is just moments away, while everything from physical therapy to acupuncture makes it the perfect place to pamper yourself. You can’t really look beyond the amazing Vitality Center for the highlight of the hotel. From acupuncture to massage therapy and everything else you could think of, this spa has it all. Among the many activities found at the hotel, Vail Mountain Lodge and Spa has its own indoor climbing wall to test out your skills and give your arms a workout! Vail may be famous for skiing, but this is a year-round vacation spot. In the summer, the scenery is a stunning backdrop to anything you do, and the hiking is every bit as good as the skiing. Just 100m from Gondola One at the center of Vail Village, Vail’s Mountain Haus combines alpine-style with exceptional luxury to bring an unforgettable experience. Featuring a fitness center, outdoor pool and a free continental breakfast that will fuel a day on the piste, Vail’s Mountain Haus has it all. Luxurious throughout, with superb service in a friendly, relaxed atmosphere, Vail’s Mountain Haus offers 75 suites of various sizes, each featuring beautiful décor and high-quality linens. In addition, rooms feature TVs, alarm clocks, coffeemakers, and DVD players. The condominium units also include kitchen facilities with a microwave, refrigerator and washer/dryer. With rooms ranging from a 1-bedroom suite to a 4-bedroom condominium, there is something to suit every party size. The hotel features a fitness center with sauna and steam rooms, wonderful dining at The George restaurant, and free use of the Vail Shuttle Route if you wish to go exploring. Vail’s Mountain Haus is an exceptional hotel that provides a unique Vail experience. The accommodation itself is perhaps the finest in the region, whether you opt for the suits or a self-contained condominium for your stay, quality, finish, and style are second to none. Most amenities in the hotel are provided with no extra charge, from your continental breakfast to free movies to watch at night, you get it all in with the cost of your room. If you need to relieve those sore muscles after a day on the piste, the fitness center includes a massage therapy service that will help you soothe those aching limbs! Surrounded by the magnificent Rocky Mountains, Evergreen Lodge is everything you're looking for in an unforgettable Colorado vacation. Located in the heart of popular Vail, Evergreen Lodge is a short walk from all the area's best shops, restaurants, and activities. Onsite, you can relax in your cozy room complete with modern amenities such as coffee maker, flat-screen television, and mini-refrigerator. The private bathrooms include Terra Green toiletries! When you're ready to venture out, you will discover there's plenty to see and do in the area. Explore the local hiking trails during the summer months, or visit the popular Bol, for world-class bowling and dining. In the winter, you can't miss out on the best skiing and snowboarding in the area at Vail Mountain Resort. Evergreen Lodge is located in the world-class Vail Mountain Resort, the ultimate destination for your winter vacation. You will discover incredible slopes for all skill levels here for both skiing and snowboarding. The resort provides an onsite ski school in case you need a little refresher. Plus, to ensure you're well-equipped for the adventure, Evergreen Lodge offers the onsite Ski Haus for ski and snowboarding rentals! Evergreen Lodge makes it easy for families to reconnect. Evergreen's premier location in the heart of Vail means you're never far from exciting activities to enjoy together. Visit the local shops and pick up some souvenirs, spend an afternoon hiking through the mountain trails, or relax in your cozy home-away-from-home that's equipped with flat-screen television and more. Top it all off with a delicious meal at the onsite restaurant, Altitude Bar & Grill! Stay at Vail Run Resort and enjoy countless outdoor adventures in the Rocky Mountains. Vail getaways are to explore hiking trails, experience exciting zip-lining, and even cast a line for fish at a river or stream. Not to mention world-class skiing and snowboarding in the wintertime. Vail Run Resort features more than 50 vacation rentals including studio suites, one/two-bedroom condos, executive penthouses, and presidential suites. Indulge in amenities like fireplaces, wireless internet, and fully-equipped kitchens. Book your next vacation today, the view is spectacular! Vail Run Resort was voted #3 resort by Ski Magazine. The resort offers access to Vail’s Gondola #1 and Lionshead Gondola with a VIP bus shuttle service. Combining the luxury of a true 5-star service with the familiarity of home, Solaris residences offer levels of service and luxury unmatched in the area. With outstanding views of the surrounding mountains, Solaris is situated in the heart of Vail Village itself, bringing wonderful accommodation and fabulous entertainment to your door throughout your trip. Solaris Residences is a unique place to stay during your trip to Vail, combining the service, fit and finish of a 5-star hotel with the ambiance of a home away from home. Featuring 79 rooms ranging from two to four-bedrooms, everything in the Solaris residences is about quality. Each room features exquisite décor, the latest home automation and wonderful fireplaces, and is the perfect setting to relax in the evening. Service is world class, with valet parking and in-room childcare. While in the hotel complex you have a choice of four restaurants, a full-service spa and an indoor pool. Each room gets a ski locker at Gondola One, while access to a free shuttle service means you can explore as you want. Skiing has never been so convenient! The beautiful décor around the hotel, with warm cherry wood and subtle tones of marble, make every room feel incredibly special. Whether in your room, the restaurants, or the pool and spa, its luxury all the way! 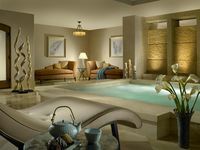 Solaris is known as Vail’s premier address thanks to its impeccable quality and 5-star service. This is the place to stay if you want to enjoy the finest Vail has to offer. Solaris residents get preferred access to Bol, the luxury bowling alley, and the Matsuhisa sushi restaurant. Both are located on-site and normally have weeks-long waiting lists. This boutique alpine hotel offers an intimate experience right in the heart of Vail itself, with 165 luxurious rooms and a focus on delivering a warm, friendly and relaxed environment to enjoy your time in Vail. Incredible standards of service and right next to Gondola One, The Lodge at Vail is the Vail experience in its purest form. The Lodge at Vail has been part of the Vail story from the beginning, opening a month before the first gondola opened for operation. Today, it sits at the heart of Vail, offering luxurious accommodations and a relaxing atmosphere for the ultimate mountain experience. Reminiscent of the grand Alpine Chalets of Europe, the hotel facilities include a comprehensive spa, two exceptional restaurants, a pool, and even a new fire pit. The accommodations are first-rate, with 165 rooms in a range of sizes, all providing luxurious surroundings with antique furniture, hairdryers, TVs and stunning views of either the mountains or the village. The Lodge at Vail is the perfect place to end a day out on the piste. One highlight is the new outside Fire Pit, the perfect place to sip cocktails and take in the majestic surroundings as the sun goes down, keeping you warm even on the coldest evening. The Lodge at Vail was built because the U.S. Forest Service insisted on an overnight lodge facility as part of the development plan. The Lodge was opened a month before the Vail ski resort itself. For larger parties or more privacy, there is also a range of individual chalets that provide blend of luxury and convenience to choose from. Located just two minutes from the Riverfront Express Gondola, The Lodge is perfectly played for any Vail vacation. With its magnificent condo-style accommodation along with three restaurants, ski and snowboarding facilities and exceptional service, The Lodge is an a year-round location that makes the most of everything Vail has to offer. Offering a wonderful selection of magnificent condominiums that range from one to four bedrooms, The Lodge brings everything that you want from Vail into one, easy to access, welcoming package. Whichever room size you go for, you get a luxurious and comfortable room that has everything you need for your stay. From TVs and other entertainment gadgets to comprehensive kitchen facilities, each condo has it all. Inside The Lodge there are three restaurants that provide a variety of cuisines, ensuring there is always something that fits your tastes. With professional housekeeping and a full front desk service, you get the best of both hotel and condo living. With easy access to the world class skiing and relaxing accommodation, The Lodge does it all. Staying just minutes from the Riverfront Express Gondola means you have almost instant access to the slopes whenever you want, the perfect location for your ski trip. The shuttle bus stops right outside the doors for the ultimate in convenience, ensuring you can easily enjoy all the benefits the entire Vail ski region has to offer. The Lodge provides you with a secure underground parking space and a ski or biking rental shop right in the lobby for the ultimate in vacation convenience. With a choice of accommodations right across the Vail Valley, Elevation Accommodation is the leading full-service mountain vacation luxury home rental source. Not only is the choice of accommodation vast, with consistently high quality, but they also provide a complete personalized concierge service to all guests in all accommodation. With a vast choice of amazing properties Elevation Accommodations offers everything from private, secluded lodges away from the villages to incredible condos in the heart of Vail Village itself. Whatever you are looking for, Elevation will have the accommodation to suit your needs and party size. What makes Elevation so special is the ability to combine the privacy and comfort you get with a lodge rental and the exceptional service and amenities of a luxury hotel. The concierge service is tailored to your needs, providing everything from dinner reservations to organizing daycare for your children. Before you arrive, Elevation can even organize the lift tickets and ski rental, so they are waiting for you at your accommodation when you arrive. It's Vail, a different way. The beauty of Elevation is that the accommodation is so varied, with individual lodges and condos to choose from in various locations, you can choose the privacy and size you need. With constant quality throughout, you will not be disappointed. Whatever you want to do at Vail, Elevation’s concierge service makes it happen. Hard to get dinner reservations or hiring a bike for a summer adventure? No problem. The concierge service will even stock up your kitchen with your favorite food and drink before you arrive, so you can simply walk in and enjoy your vacation from that first minute. A unique take on the Vail experience, The Osprey ignores the alpine style for a thoroughly modern take on the mountain lodge. Combining luxurious accommodation in its 45 rooms with exceptional service and a welcoming atmosphere, this is a Vail vacation like no other. From fine dining to a ski valet, everything you need is at found at The Osprey. The Osprey sits in the center of Beaver Creek Village, offering easy access to the famous slopes with the chair lift just a few steps away. The 45 rooms are luxurious, featuring a modern style that is unlike the alpine style preferred in most other hotels in the region. With TV and DVD player, MP3 player and phone docking station as well as high-speed internet access in every room, this is 21st century living in the heart of Vail. High levels of service are complemented by the many amenities, including the fantastic Osprey Lounge, a wonderful restaurant featuring a tapa-style menu. If you visit in the warmer weather, exclusive access to The Beaver Creek Gold Club and an outside pool are perfect distractions to make your trip memorable. The Osprey uses modern design to great effect giving it a very unique ambience that is relaxing and familiar all at once. The Osprey is the ski-in/ski-out hotel in North America that is situated closest to a chair lift, and if you consider the dedicated ski valet, that makes it the ultimate in convenience for skiers. A heated deck with hot tub and outside heating swimming pool let you enjoy the evening in comfort while taking in the astonishingly beautiful scenery as the sun goes down. The first thing that strikes you about The Arrabelle at Vail Square is just how beautiful it is. A picture postcard building housing an opulent, luxurious hotel that delivers service second to none. With European Style and American charm, The Arrabelle at Vail Square gives you convenience of a central location, sensational dining, and wonderful service. Featuring 81 luxury rooms varying in size from a comfortable 550 square feet to an enormous 2,500 square feet condominium, The Arrabelle at Vail Square is perfect for any sized party. Whichever room you choose, you find the finest linens, beautiful fireplaces, TVs and DVD players and iPads for your evening relaxation. Attention to detail is everywhere, with the result being beautiful, luxurious rooms to enjoy. Service is also high quality, with the hotel offering every kind of assistance, from ski storage to a grocery delivery service for the self-contained condominiums. A 10,000-square foot spa and a wonderful restaurant, the Tavern on the Square, offer the perfect way to unwind after a day out on the piste. The Arrabelle delivers for any Vail trip. The property has a distinctive, beautiful design that wraps around Vail Square, and has a covered escalator that takes you from the comfort of the hotel right to the foot of the mountain! The hotel straddles the Alderhof circular outdoor public ice-skating rink and the outdoor fire pits that are used in the winter. You can use the covered walkway to walk right over the top of the skaters! Located right on the mountain nestled among the aspen groves, The Pines Lodge is the very essence of a mountain resort. Overlooking the picturesque Beaver Creek Village itself, this friendly, relaxed hotel gets you in vacation-mood from the moment you step through the doors. The Pines Lodge is the perfect on-mountain lodge, blending the relaxed approach that you want from a ski holiday with the luxurious accommodation and attentive touches you need. This includes an in-room massage service to sooth those aching muscles after a day on the piste and a Four Diamond Award winning restaurant that specializes in local produce. There are 60 wonderfully cozy rooms with oversized beds and luxury touches throughout, providing the welcoming, comfortable accommodation you need after hours out on the snow. With flat screen TVs and spa quality bathroom amenities in each room, they are the perfect place to unwind at the end of the day. For larger parties, The Pines Lodge has a range of townhouses available, ranging from 1 to 5 bedrooms, offering beautiful, spacious accommodation that is sure to please everyone. When you talk about The Pines Lodge, you have to mention the skiing. With over 1800 acres dedicated to the sport surrounding the hotel, covering everything from beginner slopes to off-piste powder, its skiing paradise right outside your door. The Pines Lodge is completely dog friendly. Each dog that arrives gets their very own dog bed and a welcome basket with homemade treats. Vail Mountain acts as your backdrop for an unforgettable vacation and Lion Square Lodge features beautiful accommodations for you to rest after a day exploring! When you stay at Lion Square Lodge, you're just minutes away from all that this wondrous outdoor playground has to offer. World-class skiing on Vail Mountain in the winter months and incredible hiking adventures during the warmer months. Year-round adventures await in Colorado's Rocky Mountains! Featuring a range of amenities such as full kitchens, multiple bedrooms, fireplaces and more, Lion Square Lodge has everything you need for a comfortable and unforgettable stay! Charter Sports is located onsite, offering value-priced recreational equipment rentals. Their team of professionals provides group rates, property discounts and friendly service. With a choice of sumptuous rooms and impressive 1 to 5-bedroom condominiums all delivered within the same magnificent surroundings and the quiet, relaxing atmosphere the hotel provides, The Charter at Beaver Creek really is a perfect Vail destination. With ski-in/ski-out access to the amazing mountain facilities and two exceptional restaurants on-site, it has it all. The 24-hour front desk welcomes you into The Charter, and from there you never look back. Two-hundred thirty rooms and condominiums are available in a choice of sizes, all offering amazing, luxurious accommodations that mix European alpine style with modern convenience. Large beds, high quality linens, TVs, and even a 5 day a week grocery delivery service for select condos, ensure you always have everything you need. Service is exceptional throughout the hotel, while dining is catered for by the fabulous Black Diamond Bistro with its backdrop of astonishing views of the mountains. In addition to the amazing skiing all around, the indoor pool, hot tubs, health club, incredible Spa facility, and game room provide plenty of entertainment for any trip. The Black Diamond Bistro delivers wonderful food in a relaxed atmosphere, but it is the views as you dine that make eating here so special. The Charter is not just a ski hotel. With bike rental is available in the hotel and numerous marked hiking trails available in the summer, it’s an all year-round adventure! The Charter has its own computer room for guests, providing computers with high speed internet and a printing service should you need it during your stay.